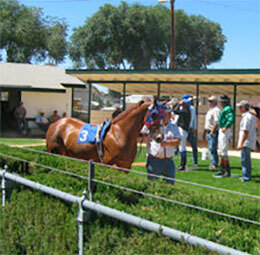 Elko Fair hosted the 6,480 Elko/AQHA Bonus Challenge (not black type) on Saturday's race card. ELKO, NV—SEPTEMBER 1, 2018—Multiple stakes winner Sparklin Cartel notched her 10th career win on Saturday when she defeated Time For Jesse by a neck in the $6,480 Elko/AQHA Bonus Challenge (not black type) at the Elko County Fair. Under jockey Rene Gutierrez, Sparklin Cartel completed the 400 yards in :19.744 seconds, equaling a 104-speed index. Trainer Garth Blattner saddled the Idaho homebred daughter of champion sire The Louisiana Cartel for owner/breeders Les and Darla Barlow. From the First Wrangler mare Sign Of Pride, Sparklin Cartel has compiled a (29) 10-6-5- record and banked more than $53,000. Eyes Movin finished third, followed by Bedu, Modelo Cartel and Rebs Courage.